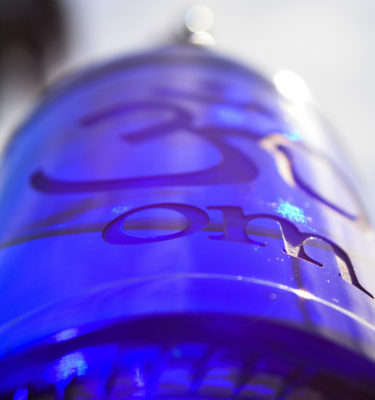 Home / Water Bottles / Blue Bottle Love / Blue Bottle Love 34 oz. In Stock, Low Shipping. 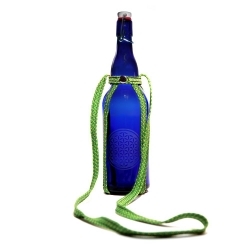 We have carry slings made from recycled climbing ropes for the liter size Blue Bottle. Click here to select yours. Blue Bottle Love 34 oz. 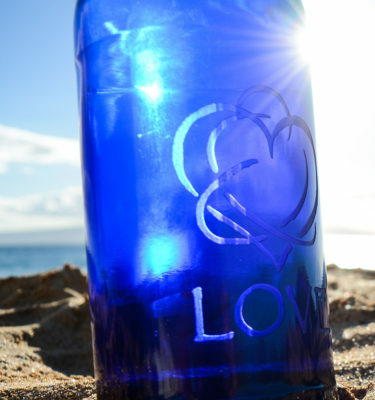 We’re delighted to have Blue Bottle Love on our product list. A customer connected us with the good folks in Hawaii making these special bottles. We think you’ll love them too! We have colorful carry ropes made from recycled climbing ropes for the 34-ounce Blue Bottle Love. Click here to get yours. 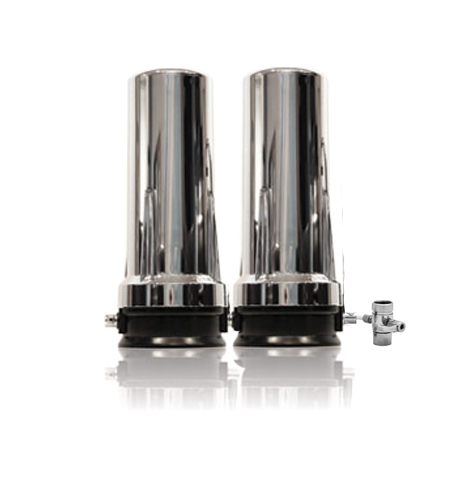 Fill these bottles with water already cleaned by our water filters. 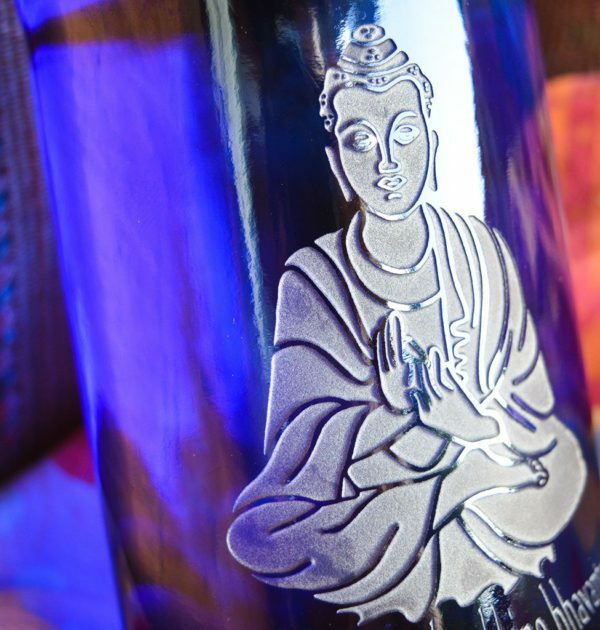 That way you’ll start with great natural water, and bless it further by putting it in your blue glass bottle. Refilling this blue glass water bottle will save Mother Earth from excessive waste of oil and water used to produce plastic water bottles. These great glass bottles are bpa-free, non-toxic, and leak-proof. That means healthy water for your body and for Mother Earth! These glass bottles build on the work on Dr. Masaru Emoto. We first learned about the fascinating work done by Dr Emoto shortly before we started Friends of Water, in 2006. We suspect you know about it. If you don’t, take a look – it’s fascinating. Dr. Emoto conducted extensive research that showed the remarkable effect on water crystals when exposed to symbols and words. Water receiving positive intentions turn out well-ordered, beautiful crystals. It seems that these crystal forms are ideal for absorption by the body, as they harmonize with our bodies. In any case, anyone who has seen the examples of the crystals in good and bad water would only want to drink those that are so beautiful. 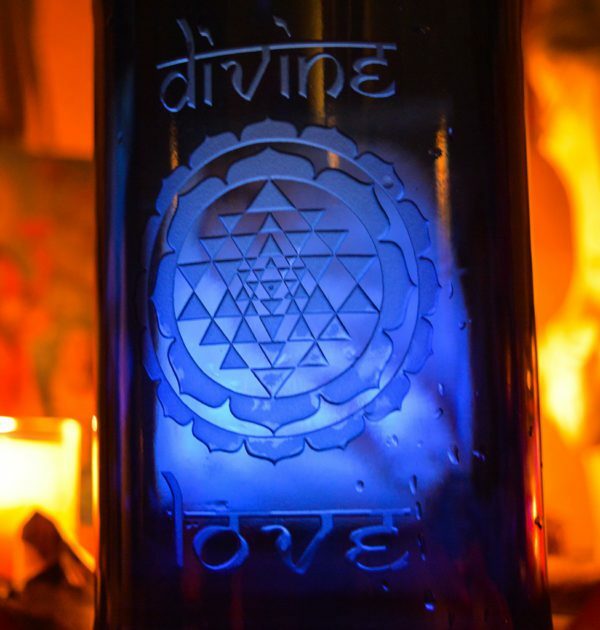 Each Blue Bottle Love glass water bottle carries with it the subtle frequencies for energizing your water with intention. 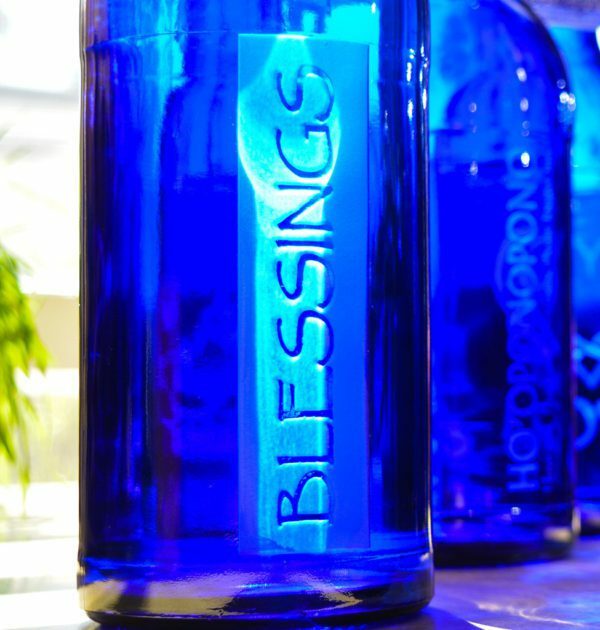 Many people have experienced that blessing your water with Blue Bottle Love blesses their lives. Human color therapy tells us that Blue decreases blood pressure and heart rate, dissolves nervousness and stress, and has a very calming effect on the entire organism. It is effective at relieving headaches and sleep disorders. Blue color therapy has also been show to aid in meditation, communication, spiritual growth and to promote a higher awareness and mental clarity. This shade of Blue is a strong but calming color. Refilling this blue glass water bottle will save our earth from excessive waste of oil and water used to produce plastic water bottles and then truck them all over the place. Plastic bottles may contain dangerous chemicals which water absorbs. These bottles are BPA-free, non-toxic, and leak-proof. That means healthy water for our bodies and for our precious Mother Earth! Each bottle comes with a special hang-tag that describes these things and that also provide the most important care tips. 1 review for Blue Bottle Love 34 oz. In Stock, Low Shipping. I purchased two of the Gratitude Blue Bottles and cant be any happier. I am on-the-go constantly and have to bring at least 60-90oz of water with me a day. I have to bottle my own water with the Fluoride Free Pitcher Plus. I love how the slim bottle fits perfectly into my car cup holder, purse, and gym bag. It is easy to drink out of or pour directly into a glass. The top mechanism keeps the water from leaking.